A long pilgrimage trail across southern Norway, up the lovely, winding Gudbrandsdal valley, then across the rough, harshly beautiful Dovrefjell to the shrine at Nidaros Cathedral in Trondheim of St. Olav, C11 king of Norway revered as the great Christianiser. 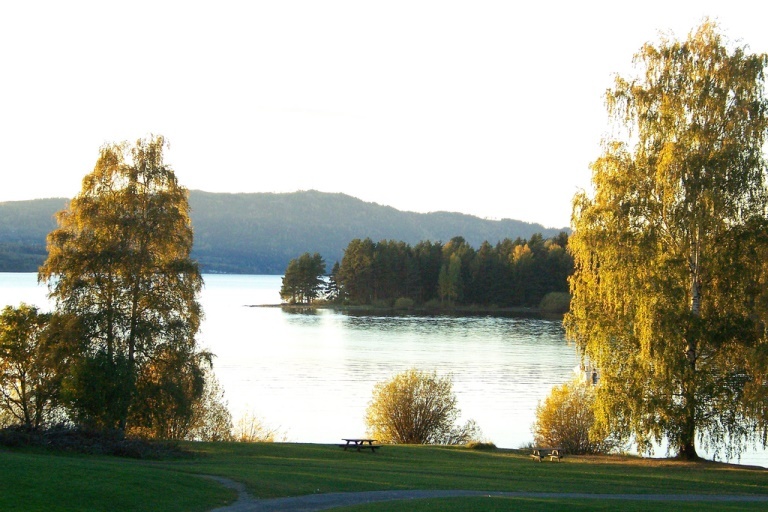 This is a very varied trail, relatively tame near Oslo then following popular Lake Mjosa, winding in to the increasingly spectacular central mountainscape, crossing arctic/alpine highlands, then descending to classic fjordlands. This is a long and in places tough trail in remote mountains where the weather is unpredictable even in summer. Come prepared. 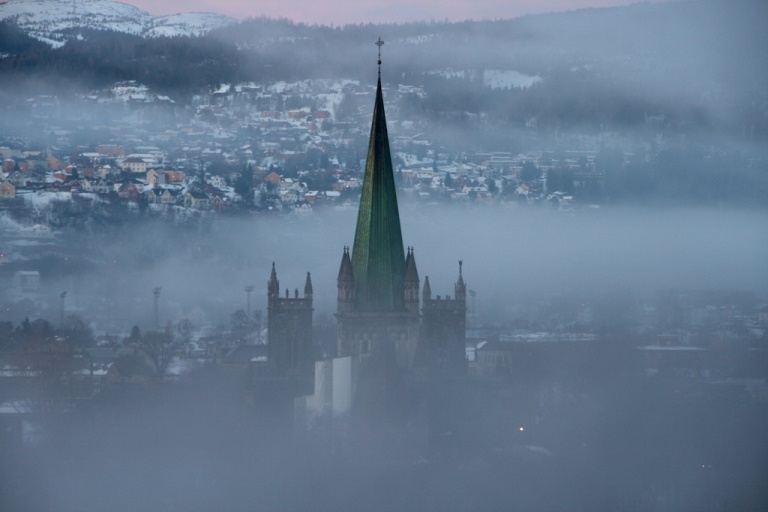 An epic 640km pilgrimage route through gorgeous landscape, St Olav's Way leads you north from Oslo to Nidaros Cathedral in Trondheim, the burial place of King Olav II Haraldsson (995-1030), who is credited with a key role in spreading Christianity in the pagan wilds of Norway in the early 11th Century. Nidaros became an important place of pilgrimage and the biggest church in Norway, indeed the largest mediaeval building in Scandanavia. Olav's story is an intriguing one, and very telling of his times. Despite being gifted during his lifetime with the prosaic sobriquet of Olav the Fat, he was to become a treasured patron saint. Olav was born into a noble family, a descendant of Harald Fairhair, who had got a long way toward uniting Norway. He grew up in the violent Viking lands outside the (relatively) civilized Christian world to the south. The Vikings were extraordinary travellers, pillagers and conquerors, reaching America and controlling territory as far apart as Sicily, Normandy and Iceland. Olav travelled as a youth to the Baltic, Denmark, England and Normandy. He is said to have been involved in the restoration of Ethelred the Unready to the English throne, and the temporary pushing out of the Danish Canute, in 1014. That winter he was with the Duke of Normandy, which had itself been a Norse dominion since (hence its name) since 881. The Normans had previously converted to Christianity, and Olav was himself converted and baptised at Rouen. Olav saw it as his destiny to unite Norway into one kingdom, following the ambitions of his famous ancestor. On his return to Norway in 1015, he declared himself king and, garnering increasing support, fought and manoevred his way over the next few years to control of more territory than any previous king, including asserting lordship over the Orkney Islands (the Cathedral at Kirkwall is dedicated to him). He vigorously promoted Christianity in his new territories, which led to deep discontent and indeed his downfall. Olav's power was clearly somewhat tenuous. While facts are in short supply, he probably depended on some sort of alliance with the powerful King Canute the Great of Denmark. But he later provoked Canute and in 1026 he was defeated at the naval Battle of the Helgea. In 1029 Canute invaded, with the support and no doubt encouragement of many resentful Norwegian nobles, and Olav went into exile, travelling to Kievan Rus and Sweden. In 1030, Canute's regent was lost at sea and Olav attempted to regain the kingdom, but he was killed at the Battle of Stiklestad near Tronheim at the end of July 1030. Olav's remains were buried at Nidaros. Signs and miracles were soon reported nearby, and a shrine was built for him. Olav was canonized at Nidaros a year after his death. Canute ruled Norway for five years after Stiklestad. His son-regents were unpopular, though, and they were driven out when Olav's illegitimate son Magnus laid claim to the Norwegian throne.The cult of Olav was a powerful unifying and legitimizing force and did give strength to the Christianising process. And subsequent rulers had a great interest in promoting his saintly status. The St. Olav cult spread throughout Scandinavia and to Britain and the Hanseatic cities around the Baltic. Pilgrims started coming to Nidaros from 1031 to pray at his tomb, and it became one of the great pilgrimage destinations in Northern Europe, its land approaches claimed to extend to some 5,000km in all, with over 2,000km in Norway. Mountain hostels (fjellstue) were built on the route, where pilgrims could find food and shelter, as were shrines, chapels and churches. 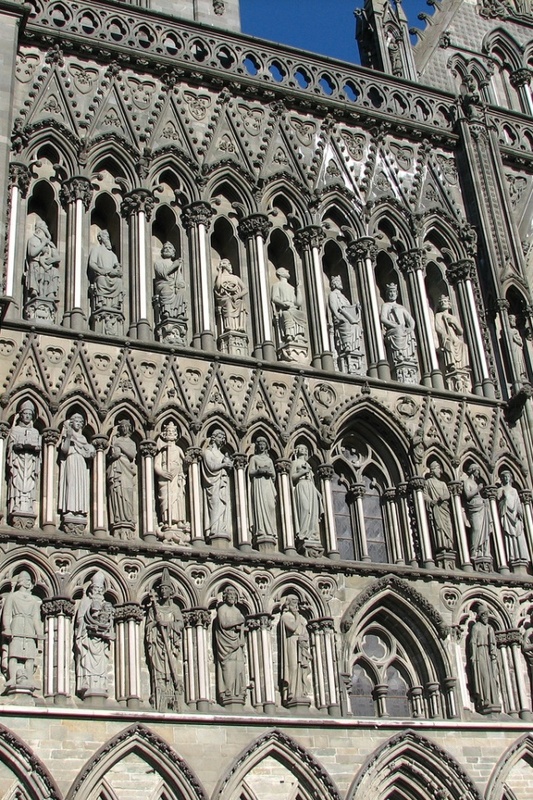 Nidaros Cathedral evolved through several churches over the centuries, from 1031 when the first wooden chapel was constructed over St. Olav's grave, to become the grandest church in Scandinavia, where Norway?s kings and queens are still crowned. Nidaros, now called Trondheim, was an important trading city and became the capital of Norway?s early Christian kings, whose successors followed these routes over the mountains to their coronations, hence the title of "King's Way". The trail will take you deep into Norwegian history and culture. These routes have been used since the Norwegian Iron Age, and you will pass the remains of Bronze Age settlements, Iron Age stone circles and Viking archaeology galore. 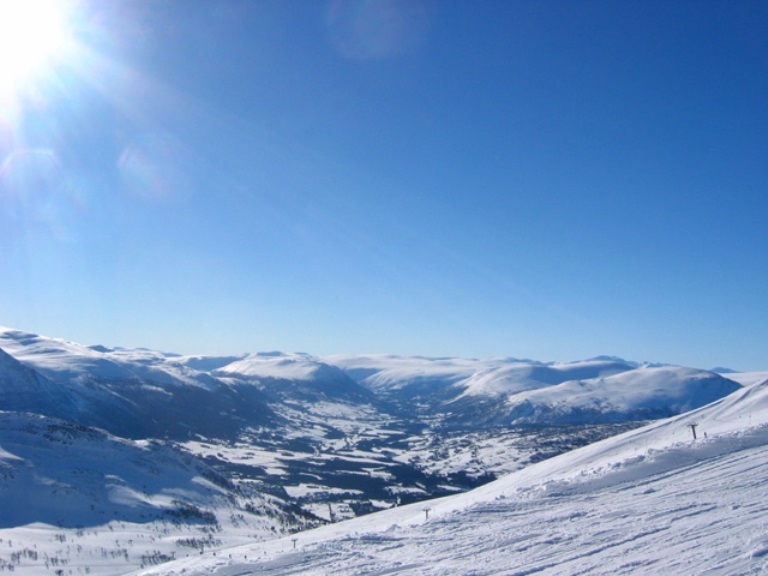 At Oppdal, an important junction of ancient ways, there are over 700 Viking era grave mounds. You will pass churches of all shapes and sizes, from the "glass cathedral" housing the remains of a mediaeval cathedral, to a wooden church, a small octagonal one, and a multitude of plain, whitewashed kirks, some housing inconsistently gorgeous pre-Reformation altarpieces. The journey takes you to the heart of the Norwegian consciousness, from the world of Vikings and their gods and sagas to the spread of the new faith, to the Troll Mountain King of Ibsen's and then Grieg's Perr Gynt, to Sigrid Undset's vivid Kirstin Lavransdatter historical trilogy based on of the Gudbrandsdal valley of the 14th century. There were numerous pilgrims' ways between the Oslo and the Trondheim areas and over the main barrier, the Dovrefjell Mountains. The modern trail follows the "King's Way", which has been restored in recent years, although one of its delights is how little it is used, and you will have a real chance of solitude and contemplation. 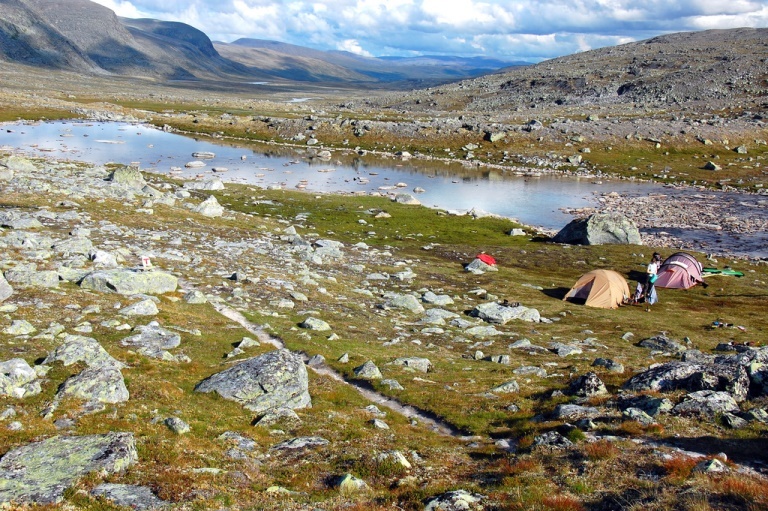 The trail heads north from Oslo, to and then beside Lake Myosa and on up the Gudbrandsdal Valley, between the Jotunheimen and Rondane, to cross the high, desolate tundra of the Dovrefjell into Oppdal and then on through the Gauldalen valley to Trondheim. The trail is generally well marked. It is fair to say that the opening stretches of the Way are pleasant and interesting enough, but not thrilling. 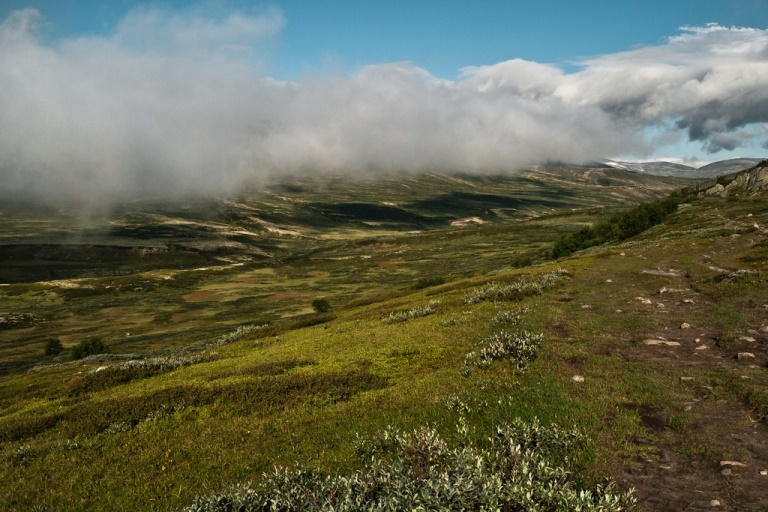 If you don't have time to walk the whole route, trekking the upper Gudbrandsdal then crossing the Dovrefjell would be generally accepted to be the finest walking: you can cover the 141km from Hundrop to Kongsvold in 5 days or so. The Way begins in Gamlebyen, the oldest area in Oslo, by the ruins of Mariakirche and the complex of the old royal court. The latter was probably built in the early 12th century, and fell into disuse after a few centuries. Few except whole-way walkers will address themselves to this at times suburban stretch. You will meander for several days beside Lake Mjosa, Norway's longest (more than 100km) and largest lake, and one of its deepest. It lies at the southern end of the lovely Gudbrandsdal Valley, which at this lower end is relatively tame and undramatic by Norway's admittedly very high standards. 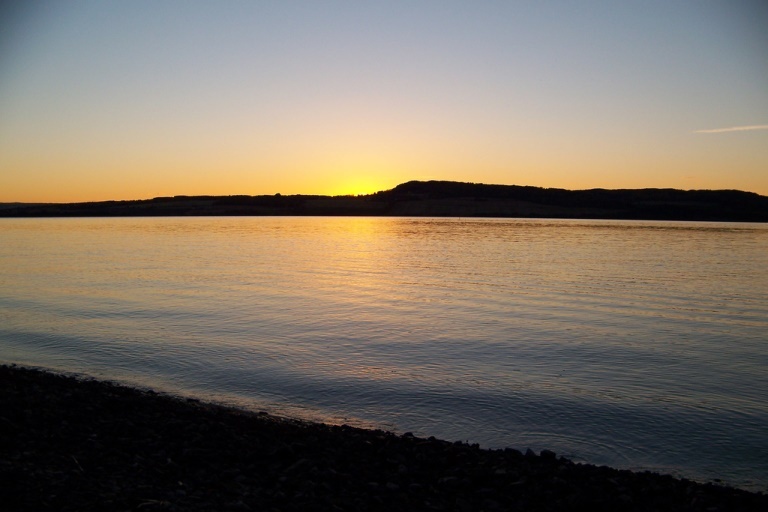 The lake becomes finger-thin at its north-western end, winding gorgeously between hillsides of field and forest. After passing Lillehammer, home of the 1994 Winter Olympics, the Gudbrandsdal becomes ever lovelier. 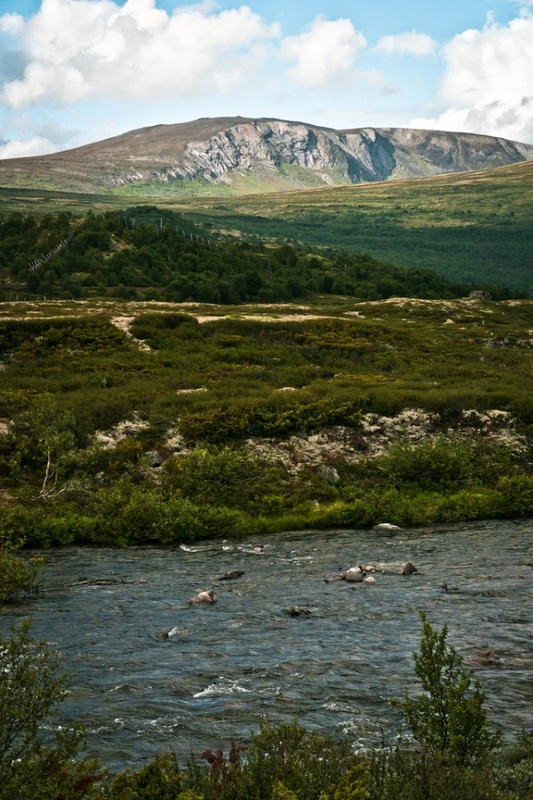 This is the setting for the Lavransdatter trilogy.The great valley slices north-west, getting increasing thrilling as it progresses, between Norway's greatest and most famous mountains, the Jotunheimen (home of the giants), which boast Norway's highest peaks and beautiful lakes meandering below giddy cliffs, and the wilds of much loved Rondane. Norway's oldest national park, to its north-east. 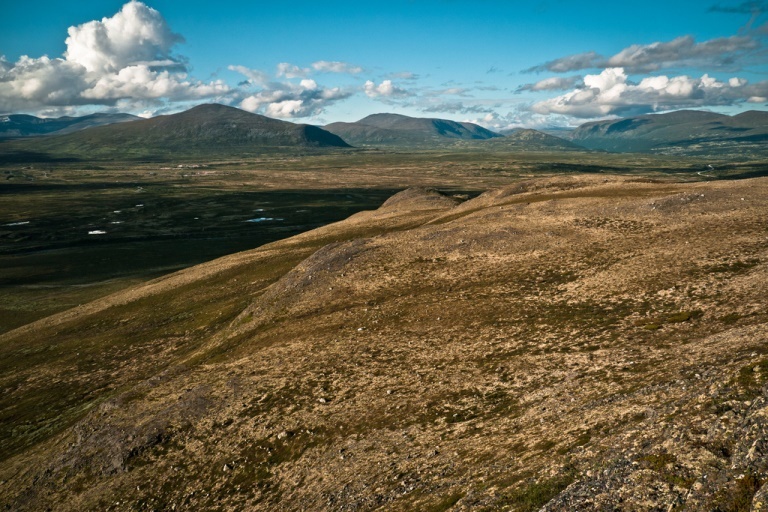 Rondane has some fantastic walking of its own and is home to rare reindeer, whilst a selection of mythical creatures are said to haunt its meadows, forests, mountains and glaciers. The trail winds through fields and pristine pine forests, with an abundance of wildlife, from the tiniest tundra flower to deer, elk and even moose. The Dovrefjell are the serious walker's high point, a tough area of blasted tundra plateau and lovely valleys below snowy peaks, the highest of which is Snohetta at 2,286m.The plateau lies at 1,000m-ish, which at these latitudes makes for an extreme world, as Scottish highlanders will confirm, and is home to many rare plants (think tender little flowers, lichen and bog) and animals, including the famous musk ox and assorted reindeer.The trail fords rivers, hopping from stone to stone. Wooden walkways carry you across the delicate (and impassable) bogs. Trailfinding can be hard up here, and the weather very unpredictable, so be prepared and careful. From Hjerkinnho, the highest point at 1,200m, it is downhill most of the way to the fjordland and the great Nidaros cathedral. 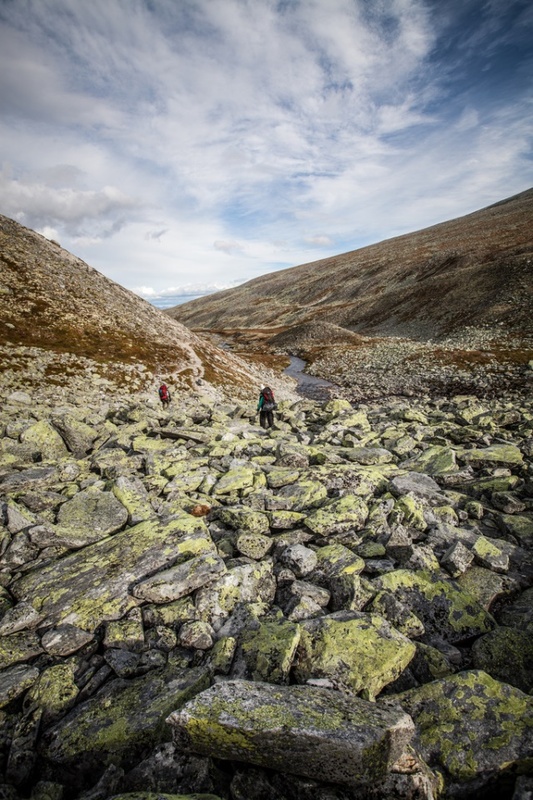 Oppdal is back in the world of farmland in the bottom of large and deep valleys; it is lovely and interesting country but your most thrilling walking is over. You gradually trudge out to the wider country beside the relatively gentle-sided Trondheim fjord. 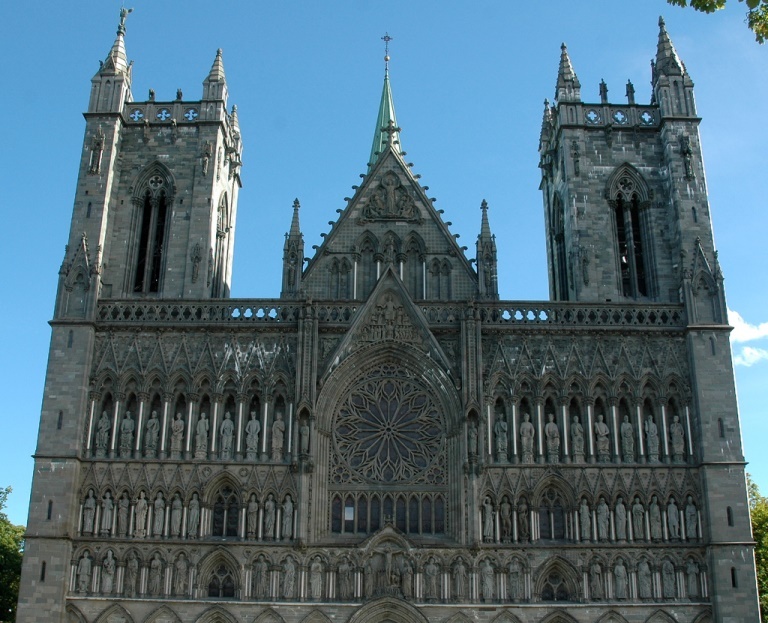 Then you are at great Nidaros, taking in the magnificent cathedral, which takes a bit of getting used to after the quiet backwaters that have been your home for the last few weeks.